The reality at one high school in Flint, Michigan, two years after the crisis began in 2014. The drinking water in Flint, Michigan, is doing a lot better these days. Elsewhere in the country, though, lead is still a problem. Especially in our schools. A new report the Government Accountability Office (GAO) published Wednesday shows that 43 percent of school districts in the U.S., serving 35 million students, tested their drinking water for lead in 2016 and 2017. Roughly 37 percent of these districts found elevated lead levels in the water. Another 41 percent hadn’t tested their water at all, leaving 12 million students in the dark. The rest of the school districts “did not know” if they had tested. Really? 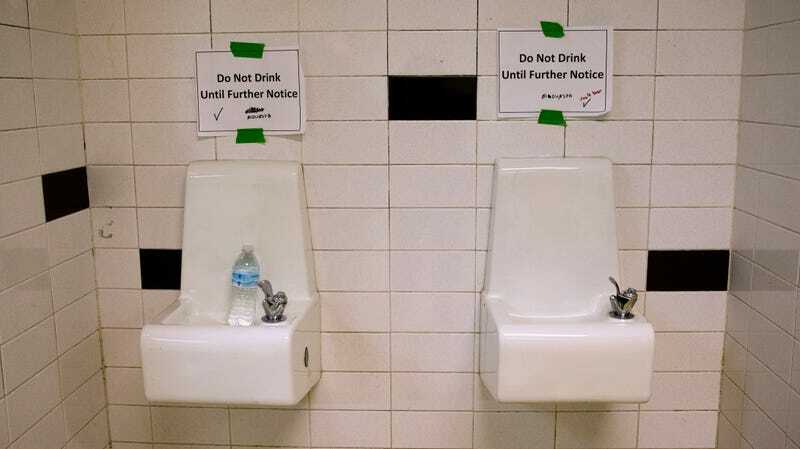 As for those districts that found dangerously high lead levels in the water, they reported to the GAO they’d be replacing water fountains, installing filters, or providing bottled water to reduce or eliminate any exposure to their students. Good on them, but still: Why do so many schools have lead in their water in the first place?! As much as the public freaked out about the Flint water crisis, this report is another reminder that the city’s situation was far from the exception. In the U.S., lead plumbing is pervasive in our outdated water systems, potentially affecting millions of people. The Environmental Protection Agency is the one in charge of public water regulations, and it’s obviously not doing enough on the lead front. At least eight states require schools to test their water, per the GAO. Another 13 states “supported school districts’ voluntary efforts with funding or in-kind support for testing and remediation,” according to the GAO report. What about the rest, though? That leaves nearly 30 other states scot-free. No amount of lead is safe for young children, especially those below the age of six. It can cause developmental delays and behavioral issues. The most common way children are exposed is through lead-based paint and lead-contaminated dust in the homes, but the youth are also exposed outside their homes. Like in the water at school. The state of Michigan moved to improve its drinking water rule to protect communities, but it’s not enough. Solving the lead crisis requires action at the federal level, too. And the current administration doesn’t seem up to the task. I mostly write about how environmental policy and climate change intersect with race and class though I occasionally write about animals, science, and art, too. We all need an escape, right?